Ancient medieval city almost completely destroyed during World War II, Argentan is a small Norman town in the Orne department. It is within fifteen kilometers away stands the Pavillon de Gouffern, a charming and old eighteenth century hunting lodge, located in the heart of the forest of Gouffern. 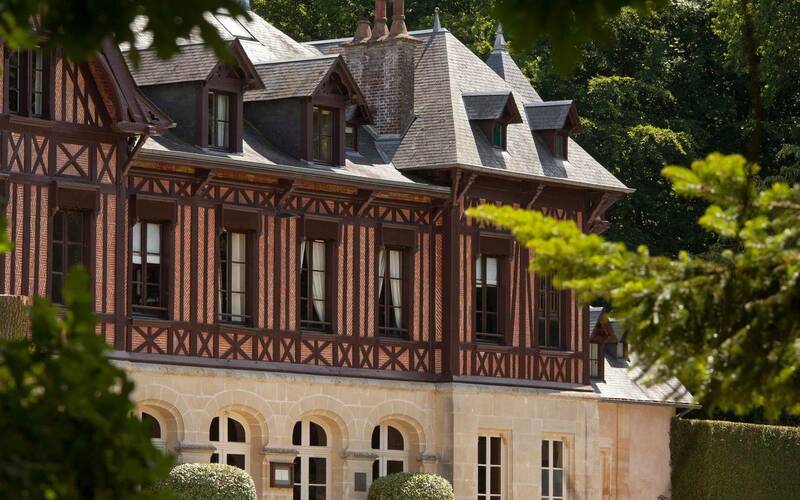 With a nearly 80 hectare park, the Pavillon de Gouffern offers an ideal base for exploring Normandy and the Orne department. The Pavillon de Gouffern has many trails for you to walk safely and in comfort in the forest of Gouffern. For the most sportier of you, some bike are available in the lobby. This boutique hotel also has a heated outdoor pool and a hydro massage bed to offer you a moment of rest and relaxation during your stay. After a day filled with walks and visits, relax yourself in one of our many lounges with a cocktail prepared by our team at the bar. The rooms are decorated with taste and refinement, each mixing materials and textures such as leather, wood or marble in the bathrooms. All guestrooms also offer great views of the park and the edge of the forest of Gouffern. Also try our "Dollhouse" suite ! At dusk, watch the forest from your window and, maybe, you will have the chance to see one of the many deer living freely in the park.